​Opening tonight a show of recent painting by Barbara Penrose, Sally Cox and I. This is the first post published here featuring an essay by a real writer. While preparing for the exhibition we chose some readings, one of which led to discussions approaching a form for the exhibition. Christine Morrow, notable Writer and Curator visited the studio, responded with interest to the work and wrote the essay below to accompany the exhibition. Images relevant to the text are appended. Press here to view my photos of my installation – images by Rod Buchholz. Sally Cox, Nameer Davis and Barbara Penrose are friends and peers who work in the medium of painting. There are points of intersection in their artistic practices and differences too. But in a group exhibition what matters most is the simpatico. 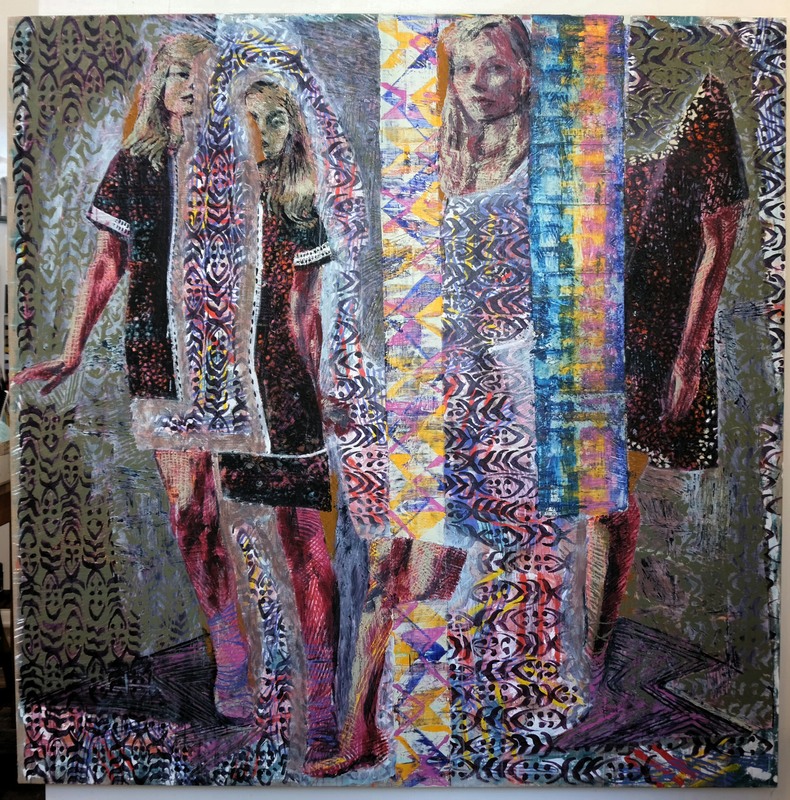 The three artists share some tastes and sensibilities; enjoy a longstanding dialogue about art with one another; produce paintings that engage in conversations with past art; incorporate both figuration and abstraction within a single image; include pattern and repetition; and engage a range of competing geometries within their work. The title of the exhibition can be read in a few ways. And each sheds a slightly different light on the artists’ approach to painting. The first way is to see the re part as being the ablative form of the Latin noun res—and identify it as the little word that commonly appears in the subject heading of a business letter or memo. That would make this exhibition a kind of communication Re: painting. Res and re both mean ‘the thing’ so according to this position, the exhibition takes painting not only as its medium but also its overt subject. The thing: painting. Painting about painting. And this construal is entirely justified because of the theoretical approach these artists take. Each carefully considers questions of: what defines a painting? what does it mean to enter into the performance of painting? and by what mechanisms does it generate meanings and effects? And each artist approaches the medium with a curiosity: searching within the painting discipline for whatever it might conceal or offer-up; always asking afresh how to make a painting and where to begin. Nameer Davis describes this task, “as if trying to place a pin, and get a twitch, in an otherwise numbed surface.” Penrose, Davis and Cox have all worked in sculpture and installation practice, so it is from both inside and outside the painting medium that they consider the rules, conventions and boundaries that delimit it. However, a newer usage of the prefix Re: has become dominant in the last twenty years. When Re appears in an email subject heading, it is an abbreviation for the word reply, and signifies that the message is sent as a response to an earlier one. And the paintings in this exhibition are utterances in dialogue with past art. Each artist quotes precursors, to whom these art works are sent in reply. 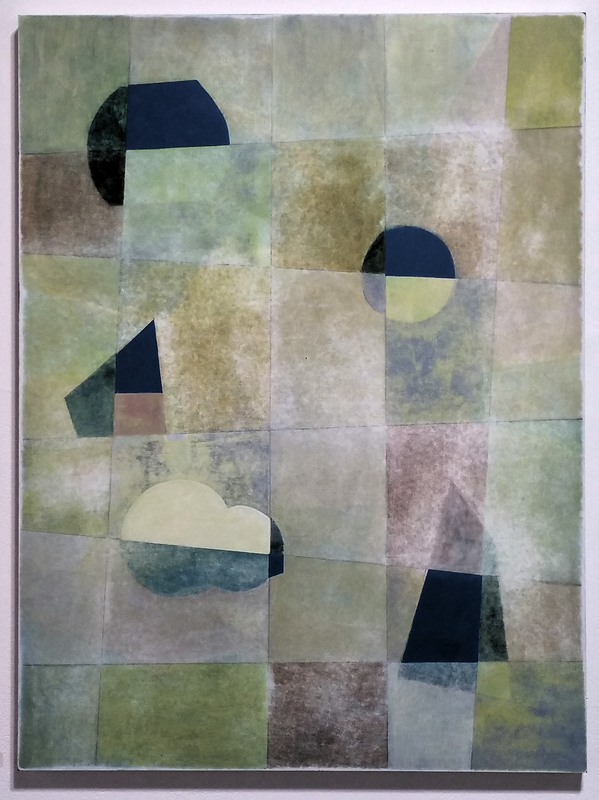 One of Sally Cox’s paintings, For Paul, is obviously a reply to Paul Klee, while others of hers converse with cubism and constructivism. Some of her paintings are even replies to modernist grids. But these answers seem to be infected with a virus; they are corrupted with a non-conformity of parts. In Nameer Davis’s works we can see responses to Sigmar Polke and Laszlo Moholy-Nagy among others. After LMN1927 features two Bendix-dot-screen-style image details marooned within patterns reminiscent of fabric prints. Like in early modernist paper collage, the sharply abutted fragments are intentionally jarring. Meanwhile, one of Barbara Penrose’s addressees is Agnes Martin and any conversation with Martin is evidently a quiet one, whispered even, as these paintings demonstrate. They are filled with stillness and silences. We can also interpret the exhibition title in a third way. As the single word, repainting. Repainting can’t help but be about repetition and renewal. To repaint something is either to obliterate what went before with a new outward-facing coat or skin, or to at least refresh parts of it. And there are plenty of hints of this here too. The content of this exhibition is painting after painting, or painting on top of painting in the figurative and literal sense. Figuratively because the art works build on art-historical foundations. Cox writes, “the only place I see for making contemporary art is in the gaps previous artists have left in their thinking, and in their making.” And literally because each painting bears a surface that has been worked and reworked. In Davis’s canvases, this manifests as a process of applying stains of colour to raw linen and incising back into the paint. In both Penrose’s and Cox’s paintings, we see layering of pigment with different degrees of opacity but there is also a lot of sanding-back or obliterating by other means; painting followed by unpainting. So, the exhibition draws out these three shades of meaning apparent in its title: concerned with painting, made in reply to former paintings, but also working painting over. And if working it over sounds violent, this is apt. Everywhere in the exhibition ruin and reparation are at work. Evidence of destruction appears in Penrose’s canvases; she selectively wipes away paint that is too dominant or contrasting, smearing it back against the ground. In Cox’s paintings, the surfaces are heavily abraded by use of sandpaper. And on some of Davis’s canvases, there is the violence of the cut line of the original collage and the engraved line that slices the skin of the paint. But the harm is ameliorated by the reapplication of stains of paint, healing the linen, like liniment. The three artists achieve dynamism in their surfaces by depositing and removing pigment; cutting and scraping; rupturing the paint skin and restoring it again by turns. The art works communicate through what is withheld too. Each painter makes deliberate omissions or suppressions. Nameer Davis introduces gaps within his images. He starts with fashion editorial and advertising pictures that he cuts apart, folds and reassembles. Internal breaches emerge between the fragments, and the spatial logic of the image disperses along these interior fault-lines. Sally Cox’s suppressions at first appear to be slightly more literal but quickly dissolve into enigma. 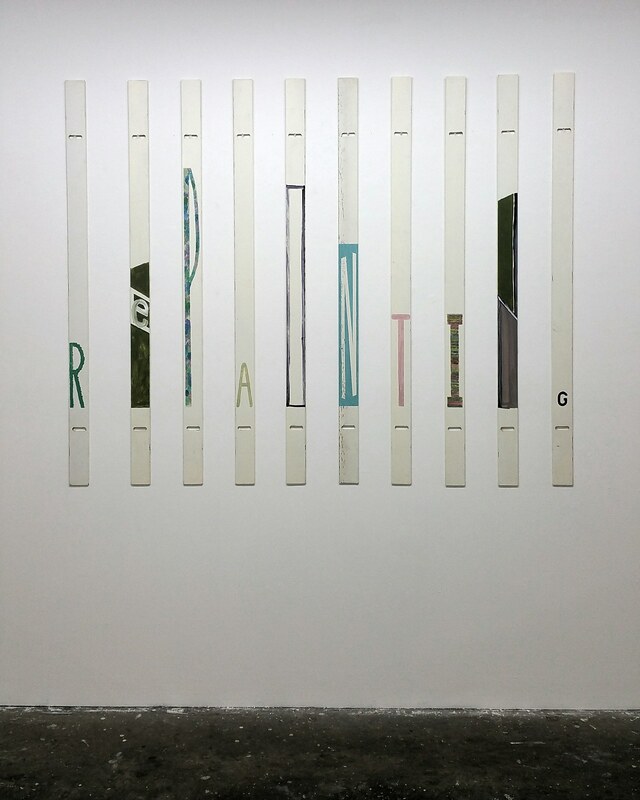 In a few of her canvases, she paints strips that look like torn fragments of masking tape, presumably functioning to redact the painting’s content. Move along folks; nothing to see here, they declare. The substance of these censored paintings is a mere signposting of what they lack. In Penrose’s work, there are redactions and veils that obscure. Small vertical strokes that populate the surfaces appear to be additive but thick, assertive bands serve to obliterate. In Cryos, they even shred the image along vertical lines. Sections of flat, white paint always remind the viewer of a painting that awaits its own making; it hints at the artist’s blank stretcher—a surface, prepared with gesso, impatient for the paint that is to come. These sections of white stripes take parts of the painting back to an undercoat and hence a beginning, an expectancy and a silence. It is in their treatments of space and geometry and in the way they use figuration that we can see where these artists diverge. Here, Barbara Penrose works exclusively with the square for the equilibrium it possesses. Unlike landscape or portrait format, it has no dominant directionality and avoids the historical baggage these two genres of painting have been loaded up with by the European art Academies. Penrose remarks that the square canvas seems to beg the superimposition of a circle. However, her interest in archaic vases and urns—in another strand of her art practice she hand-builds versions in clay—sees her use this partly-spherical form as a close substitute. In one of her paintings, we see only half-profiles of two side-by-side vases and Penrose tricks us into reading them as two hemispheres or semi-circles. But if the artist is using the shape or outline of the vase, she does not incorporate it as a figure on a ground. Instead, the form is disembodied and occupies an indeterminate space. In the dark painting, Solution, the figure hovers and levitates. 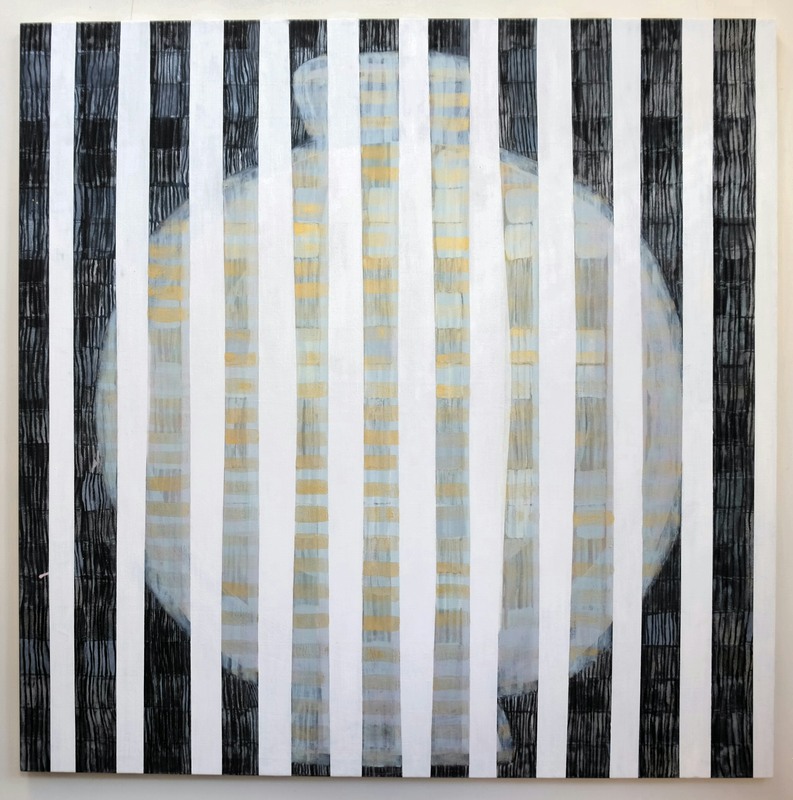 In the other paintings, the ones with vertical stripes, the vases come forward or recede according to the disruptive energies of the linear strobing. Penrose returns repeatedly to the form of Greek and Roman vessels trying to locate the elusive, idealised shapes they exemplify. With her love of classical forms and her interest in the square, circle, plane and sphere, we might imagine that she is in pursuit of a ‘sacred geometry’. But this can’t be entirely so, because she introduces techniques into her process that sabotage the idea of perfection. Lines are all hand-painted and incorporate slight wobbles. And the artist applies the paint to loose canvas that is only partly primed. Due to contrasting sections of the canvas alternately remaining lightly stained or more heavily laden with paint, the cloth provides variable ‘give’. When she mounts the finished piece onto its frame, those bold vertical stripes behave slightly unpredictably, stretching to different degrees. As a result, erstwhile straight lines adopt gradual and barely perceptible bulges; Penrose’s geometry develops a slight tremor. Nameer Davis’s geometries are a Euclidian’s nightmare. He arrives at the arrangement of painting motifs by first preparing small-scale paper collage ‘studies’. 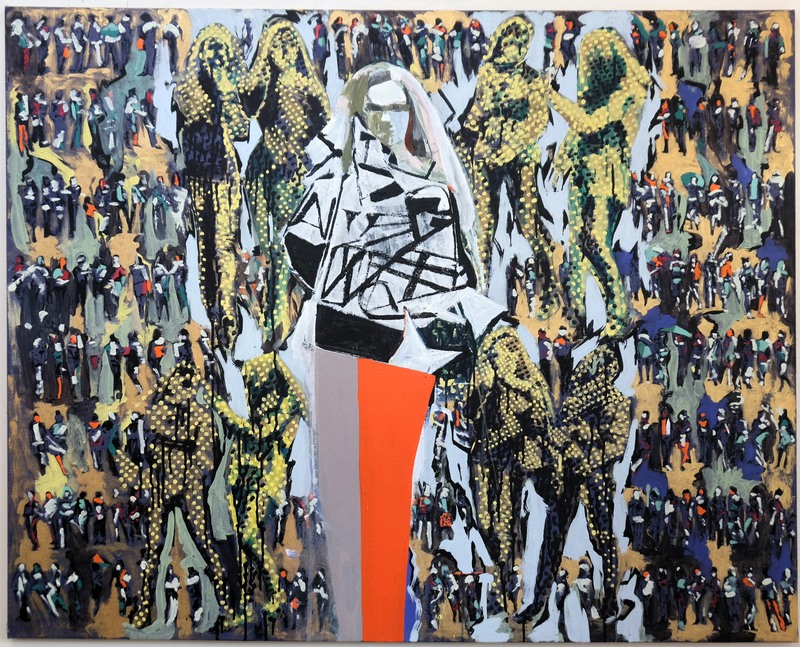 Drawing on a fashion term appropriate to his source imagery, Davis uses the word tailoring to explain the transformation of the compositions between the collages and the finished paintings. A spatial translation is required to map one onto the other, calling for some sections to be let-out or expanded and others to crushed or folded, like taking in a tuck. Some parts of the paintings seem to fight one another while others appear to merge into one another or disappear into themselves. The subjects are human figures, which appear either individually (albeit fractured) or multiply into groups or crowds. Had Davis used illusionistic space, we might have expected to see close-up and wide-angle views accordingly. And sometimes both do coexist, as in the painting Glare Right Back. Yet none of his spatial treatments behaves according to the rules. Across all the canvases, areas appear disrupted and discontinuous while magnifications are abrupt and surprising. Pictorial elements do not sit quite where they should in relation to one another or relative to the plane of the canvas. Some sections hint that they are parallel with the surface—especially the patterned treatments that resemble printed paper or fabric—but here and there we see them warped by illusions of advancement or recession. And if space appears both regular and distorted in parts, time is also simultaneously fast and slow. By working on raw canvas, Davis counts on the sequential absorption of stains of pigment. The fibres of the unprimed canvas wick away the thinned-down paint from front to back as if it retreats from the viewer. But to counter this gradual, seeping withdrawal, the busy surfaces are frenetic, clashing and immediate. The agitation and restlessness created by the dots, patterns, and fragments impart a sense of time at its most sudden, time at its most present. Sally Cox’s paintings hover on the edge of figuration, featuring bashful subjects that appear to need coaxing. These range from fragments of calligraphic or hieroglyphic notation, blobs, geometric shapes, stripes, grids, torn lengths of tape, and textile patterns—both checked and organic. The figures are mostly only hinted at and can barely be grasped. They never really emerge from the ground; it pretends to reveal them only to swallow them up. It is as if the artist is busy pushing them away even as she is enticing them out of hiding. Choosing modest motifs with the most prosaic associations, Cox avoids both drama and grandeur, content with eliciting a subtle luminescence from the dirty colours. What unifies the group of paintings is this muddied palette from the blue-green-violet end of the spectrum together with their uniform dimensions and portrait orientation. 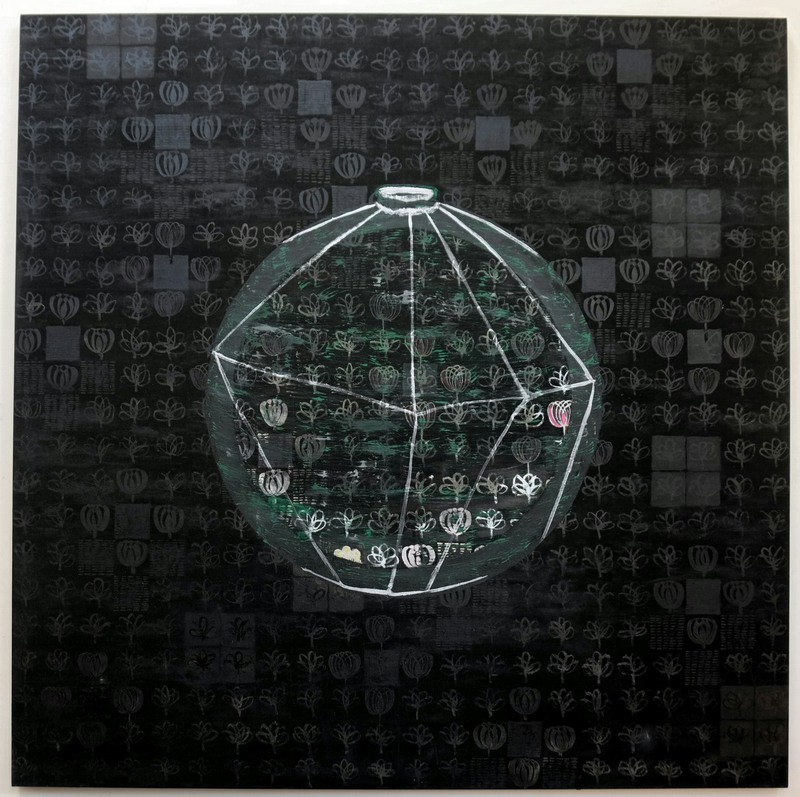 Apart from these commonalities, Cox tries not to produce variations on a theme but instead, to alter her strategy from one painting to the next. So far, I’ve avoided making references to artists’ biographies but in Cox’s case a personal detail may hold the key to her unusual handling of space. She mentions that due to a physiological condition, she lacks binocular vision. 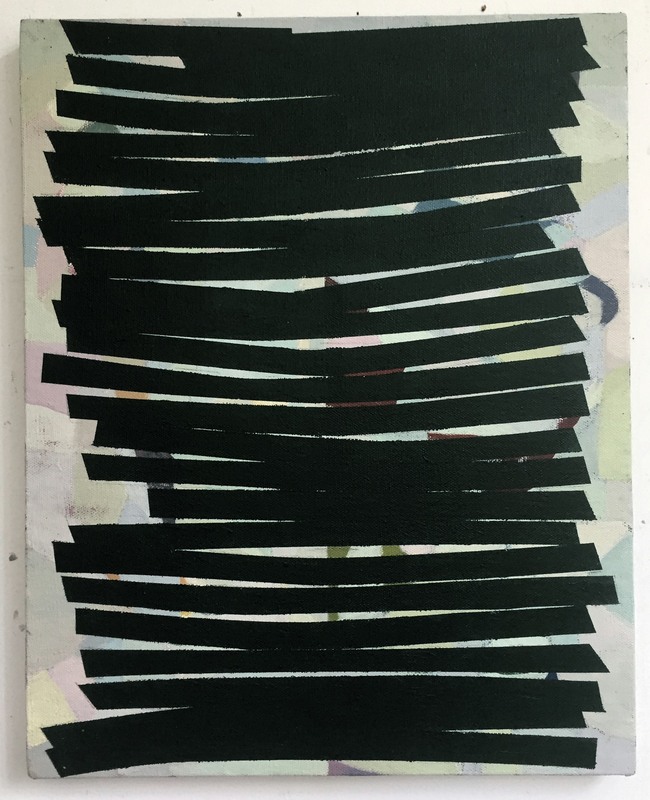 But since—as we have seen in the case of her redacted paintings—it is the lack that finally overtakes the work, so too does what is missing from vision comes to occupy the centre field. The grids that appear in some of the paintings hover on the point of collapse or dissolution. Everywhere, there is the most improbable geometry at work: her paintings reveal no focal points, only peripheries. Peripheries of every kind. There are no primary colours; she uses tertiary colour greys. Nothing is foregrounded or spot lit but receives a democratic treatment and an even-handed wash of illumination. In the painting’s mise-en-scène, the subjects are too self-effacing to be main protagonists, content with being anonymous ‘extras’ or members of the chorus. Even the humour is quiet. But here and there are subtle eruptions, as in the painting of duelling blobs titled Two Things, and the comedic tartan image called Blanket. Cox gropes towards slight apparitions and fleeting impressions, like the ones only ever glimpsed in the corners of vision. The scholarly text that informed the making of the artists’ works for this show was the essay by Giorgio Agamben translated as “What is the Contemporary?” All along, I’ve perceived they’d like me to refer to it but until now, I’ve been uncertain how to do so. In search of a means to conclude this essay, though, I see how I can play this out. Although it’s not his principal subject, I recall the text contains a lovely rhetorical treatment of light and darkness which chimes well with a visual medium like painting. It’s conventional to think of darkness as a passive absence rather than a dynamic presence. However, Agamben explains the physiology of its perception in a way that reveals darkness as a positive and productive capacity, not a privation. His description takes us back to the motif of periphery discussed above: he notes that when light is absent, this triggers the off-cells at the outer edges of the eye’s retina and these cells actively generate a vision of darkness. Perhaps he’s taking a passing swipe at the Enlightenment insistence on marrying the motif of light with truth and reason. But either way, he stipulates it is the glimpse of shadow that is required for understanding. After all, those phenomena that are closest to a subject appear the least illuminated in their sight. Where is the vantage point from which to view something that is touching one? It must remain obscure and occupy only the peripheral vision. In Agamben’s insistence on the role of obscurity, I think I understand a little: the muddying of Sally Cox’s colours, the black gesso in Barbara Penrose’s paintings and Davis’s reminder to us that every time an artist brings paint forward onto raw canvas, it retreats a little. Thanks David, I was quite surprised by the transformation of the paintings onto the wall, there’s a slowing down of the image as it’s set into the pattern work.